The Maritime Labour Convention (MLC) states that all ships carrying over 100 crew members and passengers for voyages of three days or more must have a medical doctor onboard. However, the majority of merchant vessels are crewed by fewer than 25 people and therefore don’t benefit from an onboard healthcare professional offshore. When asked if seafarers felt that they had the same quality of healthcare at sea as they did onshore, 82% of those surveyed stated “no” and the main reasons given related to the lack of access to a GP. In fact, a staggering 68% of those questioned had been on a vessel that was forced to divert due to a medical emergency and 70% had been on a vessel where there had been a medical evacuation. Emergencies experienced at sea ranged from severed limbs and broken bones, to gunshot wounds, tropical diseases, allergic reactions and Sudden Cardiac Arrest. Many crew rely on a physical copy of the Ship Captain's Medical Guide for medical guidance when working on board a ship. When asked what would make them feel safer at sea, 82% of those questioned specified the ability to transfer live vital signs to a UK based medical professional who can diagnose patients and offer advice. 98% of seafarers agreed that a greater provision of telemedicine on vessels would save lives. “In this day and age, it is crazy that I should be flicking through an outdated book to try and diagnose appendicitis, when there is technology available to let an expert diagnose it for me,” said one seafarer. Martek Marine offer the first complete telemedicine solution available for a monthly fee. iVital advances offshore medical care and saves lives. Available with no capital investment, iVital is cost-effective and accessible. The impact on safety of life at sea is huge, with benefits including; increased patient engagement and better patient care quality; quicker and more convenient clinical access; a reduction in lost time through illness and injury & improved crew retention and reduced, unnecessary patient evacuations. Martek Marine was formed by Paul Luen, Mike Pringle and Steve Coulson to offer pioneering solutions to improve safety, performance & welfare on ships. With steady growth across the world maritime industry, Martek Marine is now a truly global business supplying services to over 80 countries. The company are the world leader in crew welfare technology, offering products designed to simplify your obligations as an employer and provide a safe working environment. Thanks to disruptive innovation, the company provides products & services that are actively sought by shipping companies to deliver major operational safety gains and cost efficiency. 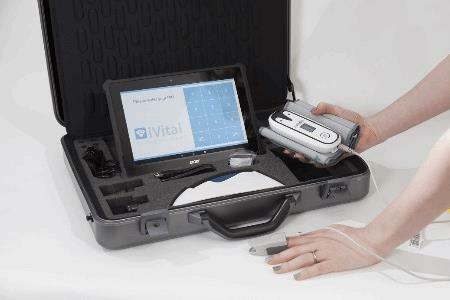 The range includes the recently launched total maritime telemedicine solution, iVital, as well as Lifeforce AED, the only marine approved defibrillator. Accreditations include; ISO 9001; Investors in People (Gold); The Institute of Customer Service; Queen’s Awards for Industry and Sunday Times Fast Track 100. For more information, visit www.martek-marine.com.